Peripheral tumors are rarely suitable for endoscopic resection. However, this case representing purely endoluminal disease can be considered an indication for resection with potential for cure. Complete obstruction of the lower lobe bronchus by extrinsic compression or by endobronchial disease can sometimes be resolved by rigid bronchoscopic dissection and debridement. In order to prevent recurrence, the placement of a stent is possible, albeit sometimes at the expense of the apical segment of the lower lobe. 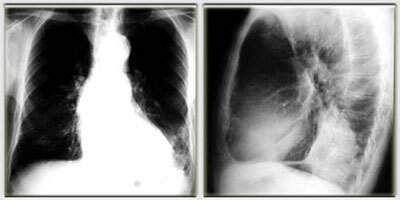 This case illustrates compression of the left lower lobe bronchus by mediastinal torsion following pneumonectomy. This patient presented in respiratory distress. 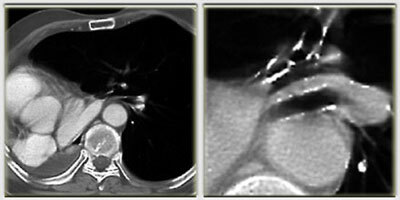 Following dilatation and stent placement, the patient’s pulmonary function improved by 40%. This patient has now survived over three years despite repeated treatment for additional tracheo-bronchial metastases and stent replacement.